Welcome to the Student Ministry at Blinn Brenham! DESSERT FIRST! is our program at Blinn College in Brenham, Texas. 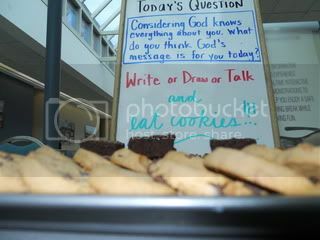 Every Thusday at lunchtime, students are invited to come by the table, eat goodies, and chat about our QOTD (Question of the Day - i.e., Who is God to you? or What makes you angry about the world?). We set up in the Student Center near the entrance. ALL students are welcome stop by the table and/or join us for Bible Study. If you are interested in learning more about or baking for this ministry, please be in touch with our Campus Minister, Pastor Rich Nelson.